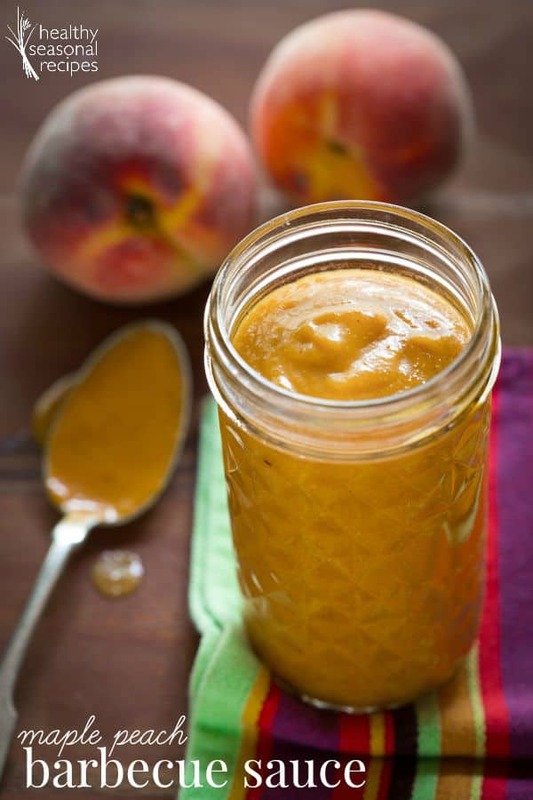 This maple peach barbecue sauce is sweet, tangy and spicy. It is paleo friendly, vegan and gluten-free and is super simple to make. We’re still staying at our place on Lake Champlain, which we share with my sister and her husband. The food sharing has been a little less smooth going so far this summer, and I have realized that my girls are chowing down on my sister’s groceries without my knowing it. This is how I found myself making a trip to the store yesterday in search of replacement peaches and plums that my little snackers had pillaged from Jessie’s fruit stockpile. When I got there I saw that local Vermont peaches were finally here I went a little wild and bought enough peaches to resupply Jessie’s stash plus some. On the way home the girls and I brainstormed what to make with the extra peaches that would work for dinner and the blog. I mentioned the idea of making peach barbecue sauce with maple syrup and my oldest daughter told me I HAD to make it. It came together really easily. I just sweated a sweet onion in a pot and then stirred in some spices to bloom them. I chose to use a heavy hand with the chipotle powder because this is a condiment, and is meant to be too strong on it’s own. When brushed over the chicken it was just the right amount of heat. After blooming the spices I stirred in peeled chopped peaches, dark maple syrup and cider vinegar. The peaches softened really quickly because they were so ripe to begin with. Then I just blasted it in the blender to make it smooth. I brushed the sauce over the grilled chicken in the last minute or two on the grill and it came out so well. It was sweet, spicy and tangy. Yum! 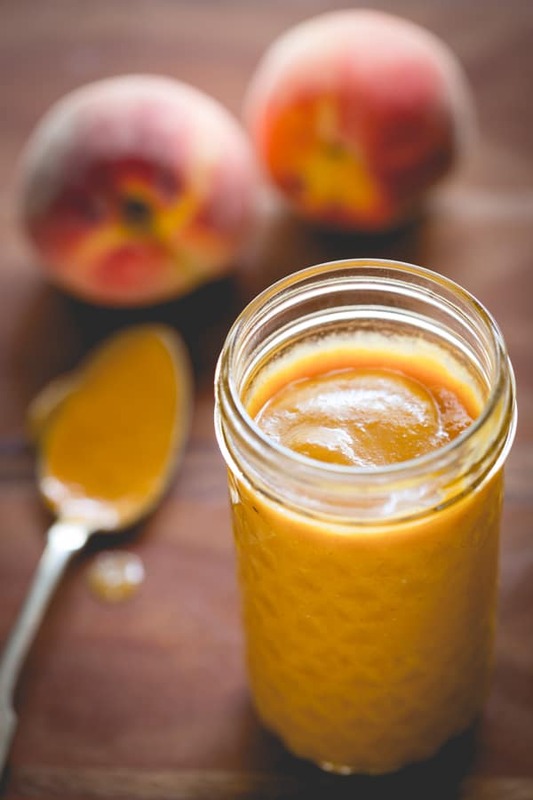 Maple peach barbecue sauce, paleo friendly, vegan and gluten-free. This no tomato barbecue sauce is sweet and spicy and tangy. Brush it over chicken in the last few minutes of grilling. Swirl oil in the bottom of a large saucepan. Add onion, cover and place over medium heat. Cook, removing lid and stirring occasionally until the onion is softened and starting to brown, 12 to 15 minutes. Sprinkle salt, chipotle, cumin, and allspice and cook stirring until the spices are fragrant, about 30 seconds. Add peaches, maple syrup and vinegar, and stir to coat. Cover and increase heat to medium-high. Bring to a simmer, reduce heat to medium low or to maintain a gentle simmer and cook until the peaches are completely soft and breaking down, 4 to 5 minutes. Transfer to a blender and puree until smooth (use caution when blending hot liquids.) Cool before using. 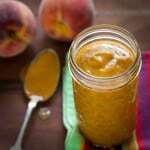 I’ve wanted to make my own peach BBQ sauce but it called for pomegranate molasses… I have all the ingredients for yours so I just pinned to try!! Oh great to hear it. This is so simple. Hope you enjoy it Cassie. This sounds incredible! I would slather it on everything! I am thinking it would be great for dunking too. Ooh the possibilities! Thank you Anne! Have a great day! Hope you like it Rebecca. Thanks for visiting. Ha!Ha! 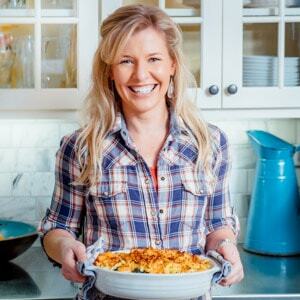 My kids are scavengers too–they eat and eat and if we are staying with others, I ALWAYS have to provide extra food. They ask first, but they can EAT! Love this BBQ sauce. SO true. I never know when they are going to have a hungry day. Sometimes when they are too busy having fun they forget to eat, and then they make up for it by eating soo much. If only adults could be as intuitive as they are. Lol!!! It is too strong to eat solo. Though I would find it funny watching you try. Sweating and blooming, lol. I didn’t even realize that they were unusual. Ha! Ha thanks Allie. I am such a countertop appliance fan. Anything that can make my life easier. Hi Katie!! I’m so glad I just stumbled upon your blog this afternoon. 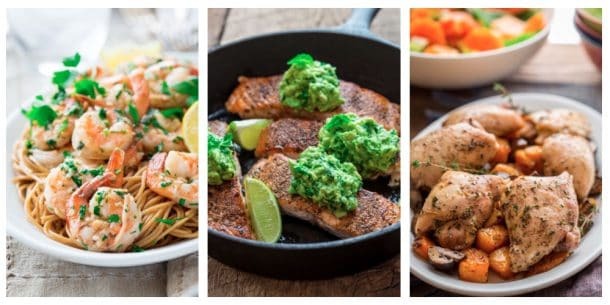 This looks AMAZING and I am always looking for new and interesting sauces that don’t pack in the sugar/fat. Yum!! Hey Dani! Welcome and thank you so much. Glad you like this recipe. And totally agreed about finding healthier recipes. I’m all about that too! Cheers! It’ll be fine in a jar for a week or so. Make sure you cool it before sealing the jar thought. Happy cooking Margot! I want to eat this straight off the spoon!! Lol! It is pretty spicy, so I wouldn’t advise it. Ha ha! I’m going to try this today, but now there’s only two of us. Could you freeze what you can’t use in a week? Absolutely! Go for it Denise. Hope you enjoy it. This looks great! I’ve been loving chipotle chili powder lately, so it looks like I’ll need to try this. Thanks for the recipe! Thank you! And thanks so much for coming by Megan! Nice can’t wait to try! Thanks Nick. Glad you stopped by!